On a plant tour to Crete with my students this spring I was reminded of the many and intricate places where plants grow in the wild. They have become adapted to a myriad of different conditions in their natural habitat and to grow these plants successfully in our gardens we need to ‘copy and paste’ the conditions for the best results. One of the best ways to provide these conditions- be they soil preferences or light needs or specific temperatures - is to use containers. Personally I also like to have ‘tricky’ plants somewhere that I can see them as I pass during the day and thus keep a more constant ‘eye’ on them. I prefer a stone based container which to me looks good as well as being practical, stone tends to provide a more stable soil temperature rather than the thinner ‘modern’ terra cotta pots. I can use specific soil types in each container – for some of the Cretan plants this will be an open sandy mix and I can place the trough in full sun or partial shade depending on the plant. Cyclamen graecum, a delicate autumn flowering species we saw growing on open gravelly hillsides this October needs to be in full sun in my most protected site while Cyclamen repandum which we have seen on the Italian Plant Tour loves partial shade. It requires a more humus rich soil which is easily provided in a container and a shaded site to reflect the dappled shade where we have seen it growing on a wooded hillside near Latina. Plants from the Drakensbergs region of South Africa, with its wet summers and cool dry winters, are also on my ‘lust list’ of plants which I find difficult to live without. Pelargonium species come from here as well as those from the better known Cape region of South Africa and P.sidiodes with its small dark maroon flowers and silvery leaves is ideal for a stone container. It loves summer rain, unlike the better known Cape species so keep it dry in winter and pour over a bucket of water as you pass it in the summer months and watch it grow and thrive. I want a garden which is full and overflowing with plants. The smaller the better works well and planting in layers is ideal for me. Layers are achieved by one or two trees in my garden which are then under-planted by different shrubs, both deciduous and evergreen and in turn beneath these are all the bulbous and herbaceous plants which I find difficult to live without. Snowdrops are ideal for a smallish space and perfect for my garden. However they come at a price and my most cherished species and cultivars are best in a container where again I can see what they are up to. Released into the open garden they are happy but they are also exposed to the vagaries of my summer weed and clean up. Digging over the beds at that time of year is excellent but snowdrop bulbs can be spread well away from their labels even with the best intentions to leave them alone and so a ‘safe’ container is the best alternative. A recent tip I have been given is to plant snowdrops about 6 inches deep (deeper than the usual rule of thumb for a bulb of that size ) and separate them so that should disease strike then infected bulbs can be removed before the lurgy spreads to their neighbours. We will be returning to Crete this Spring on another plant tour to see and learn about more plants and how they grow in the wild. Replicating these natural conditions is by far the best way to succeed with plants and I will be also casting my eye over J’s Garden Antiques so see which ones will work for them back here in England. Rosemary Campbell-Preston is principal of The Plant School. The school is based at the Garden Museum, Central London and takes students of all ages and capabilities. All courses run once a month through the year from September to the following June. Do you have a long narrow space along the side of a building, under a window, on the edge of a courtyard which is bare and in real need of brightening up? Somewhere perhaps where you don’t want to put something bulky restricting the space. A long stone trough may be the way to go. Raised up on stone bases these lovely long troughs make a real statement without taking up much space at all. There is enough depth for planting a wide variety of plants, not just alpines as is sometimes the case. I love to put lavender and other herbs into them. Colourful and aromatic. It is their apparent gentle strength which I have always loved about lions - especially the male lions reclining or sleeping. My most favourite has always been the Antonio Canova lions guarding the tomb of Pope Clement XIII at St Peter’s Basilica in Rome. Both reclining, one awake and one sleeping. The artist carved these over a 10 year period from 1783. I have come across good reproductions of these lions only a handful of times. One sleeping on a grave in a London cemetery which is simply beautiful. So peaceful. The originals are carved in marble and 2016 will I am sure be the year I will see these in the flesh! In the meantime I endeavour to find lions carved and moulded in all sorts of media with the same gentle strength. 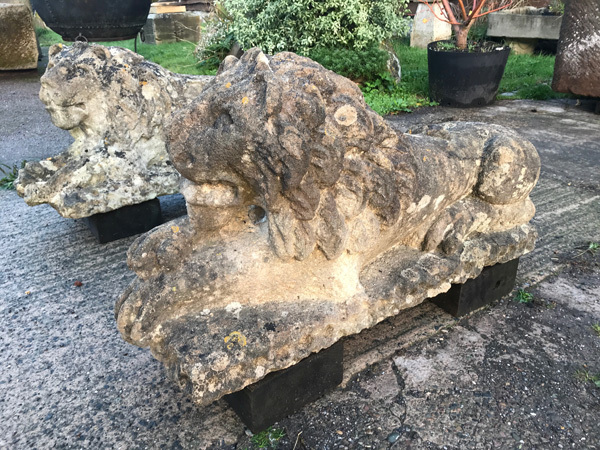 We currently have in stock a beautiful small lead lion head fountain. Small but with huge character. A lovely old pair of stoneware terracotta seated lions. Very strong and proud. A 20th century composite pair of large recumbent lions which I simply love. Awake, gentle and strong.